A set of the four continents from Heylyn's 'Cosmography in Four Books. Containing the Chorography and History of the Whole World, and all the Principal Kingdoms, Provinces, Seas, and Isles thereof'. This is the second edition of Henry Seile's map of America, first published in 1652 and based on John Speed. 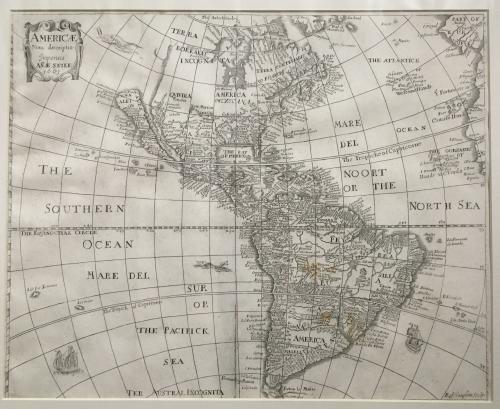 The map has been re-engraved by Robert Vaughan at the directiion of Seile's widow Ana. The map is very simlar to he earlier map by Henry, although the nomenclature of the Deleware River, Carolina and several places on the west coast have been changes. A marvelous early American map. 2) Africae Nova Descriptio - by Ana Seile. The maps are all in very good condition, although Asia has been rebacked for stability. Asia also has some areas of loss at the lower centerfold and left upper area.